Houston is a sizable city, which means it’s home to many medical and dental facilities that can provide first-rate services at all hours of the day. Finding an emergency dentist in Houston TX when those urgent situations arise is a lot easier than you may have thought, with our free service Emergency Dentist USA. Emergency Dentist USA is here to help you locate a local emergency dentist near you that can help you during your time of need, 24 hours a day, 7 days a week. You can simply pull up our web portal to locate a dentist near you in the Houston area, or you can call our toll free number and our operators can assist you in finding the perfect dentist and also help set up an appointment if necessary. Thank You Emergency Dentists USA, My young daughter fell off her bike Friday night and chipped a tooth. She was unable to eat or drink, every time she did she would start crying and it was breaking my heart. We didn’t have the money to make a trip to the emergency room, and all the dental offices we tried to call were just giving us answering machines. We were able to get in to see an urgent dentist that night at a clinic that wasn’t that far from our home! Thanks Again! Whether you are traveling to Houston or live in the area, you’ll be happy to know that they have many dental clinics that have after-hours care during the week and on the weekends for any dental emergencies you may face. From our list below, Emergency Dental Care USA – Houston is a great choice because they are open from 9 AM to 9 PM on Sundays. The wonderful thing about this clinic is that they do not charge any additional fees for after hours and weekend appointments, as some other emergency dentists may. Find a 24 hr dentist in Houston quickly and easily by calling our hotline 24/7. If you are needing to get in to a dentist right away, Dentistry of Highland Village is perfect because they welcome walk-ins and emergencies! They are open extended hours, 7 AM to 7 PM, in order to take care of any emergency their patients may face. If you need walk in denture repair, this clinic may be great for you. Per our research, there are no dentists in the Houston area that are open 24 hours. Emergency Dental Care USA – Houston has extended hours during the week and are also open on Saturdays and Sundays, making them a great choice when you are looking for a 24-hour dentist. They also have an extensive emergency dental services page that gives you helpful information on what to do when you are facing different dental emergency situations. If you’re suffering from gum disease and need to find a periodontist in Houston fast, our services can help you find care. Sometimes, your dentist may recommend receiving dental sedation to make your care less painful. Our directory can help you find a nitrous oxide dentist fast and easy. “When you call an emergency dental office, it is as important to discuss the financial expectations as it is your symptoms. Many patients think that dental insurance will cover 100% of the costs associated with seeing a dentist. Description: Call to be connected with the perfect urgent care dentist for you! We have the connections to find a dentist to fit your needs, and can get you an appointment immediately. Emergency Dentists USA can help find an emergency dentist for you, with our without dental insurance coverage. Easily find Texas emergency dentists with our service. Description: Whether you’ve chipped a tooth, or you just need urgent relief for a toothache, Emergency Dental Care USA in Bellaire is available for same-day appointments and treatment (whenever possible). Their experienced and compassionate staff will help make your visit as quick and comfortable as possible. They also do not have any additional fees or surcharges to be seen on weekends or even holidays. They accept dental insurance, call to verify if your specific plan is covered. They accept cash, most major credit cards and also have several financing options. Description: Having hours from 7am to 7pm seven days a week makes this dentist a great option for you to choose to resolve your after hours dental care necessities. They offer general dentistry as well as welcome emergency situations and can take of you anytime during their extensive open hours without an appointment. Walk ins welcome, no appointment necessary. Description: Signature Smiles started with the idea of meeting every patient’s need, regardless of circumstance, age, or financial constraint in one location and has since expanded to three locations throughout Houston. They can take care of adults and also children in a general dental as well as emergency situations. They also have bilingual staff to assist their patients. Description: Oak Forest Dental group has excellent hours of service and offers a great opportunity for finding an emergency dental appointment in Houston. They have the most modern equipment which enables them to be faster, less invasive and more effecient in their procedures. They are open extensive hours and welcome after hours and weekend calls in emergency situations. They accept cash, most major credit cards and also have financing through Smile Generation. 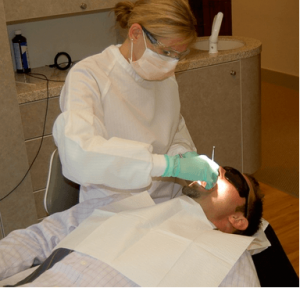 What Should You Expect During Your Houston Emergency Dentist Appointment? Visiting an emergency dentist in Houston, TX will be very similar to a regular dental checkup. You’ll want to be prepared to fill out some paperwork when you arrive. This paperwork will assure that you are seen quickly by giving the dental office a bit about your medical and dental history. You will want to arrive 15 minutes early, if at all possible in order to have time to fill out the paperwork. Another thing to keep in mind, is how you plan to pay for your visit. Check with the front desk staff about their payment options, whether they accept your dental insurance and financing if needed. The front desk staff is also equipped to handle patients who are anxious, as they know dental emergencies can be scary events to face. Speak with them about any anxiety you may face and they can help walk you through what to expect at your appointment. You may need a tooth extraction for any number of reasons. Sometimes when a tooth reaches a certain level of infection it will need to be removed. Some of the symptoms you may first notice are intense pain in the tooth and very extreme sensitivity to hot or cold. You could also see discoloration of the tooth in these instances. When you feel these symptoms, you’ll want to get in to an emergency dentist right away. There are numerous after-hours dental clinics in Houston, TX that handle emergency tooth extractions daily and are skilled in managing the pain and your fears and worries about the procedure. Emergency Dentists USA’s portal is a great place to locate a 24-hour dentist in Houston TX. When pain has got the best of you and you don’t know where else to turn, we have found clinics that are here to help you immediately! Issues ranging from abscesses to impacted wisdom teeth are among those that you will want to see a dentist for immediately. When these situations occur, check out our website or call our hotline and we can assist you right away finding a dentist that will meet your needs, 24 hours a day, 7 days a week.